Neil Young's exquisitely relaxed 'Sleeps With Angels' (**** out of four) offers further proof that the godfather of grunge remains rust-free at 48. The album, out this week, initally seems slight and stark, a deceptive first impression. Casual as a back-porch jam session, 'Angels' reveals depth, complexities and hidden charms on repeat listenings. Young's first studio release with Crazy Horse since 1990's 'Ragged Glory' is less noisily ragged but just as glorious, especially in its guileless articulation of loss and alienation. The absence of the usual Young 'n' Crazy thundering distortion (in full bloom only on the 14-minute-plus epic 'Change Your Mind') doesn't diminish 'Angels' power. Though restrained , the band percolates with subtle experimentation and porous arrangements. On the chilling 'Driveby', about a woman killed in gang cross-fire, Young bemoans the random deadliness of living on mean streets and underscores the tragic tone with tortured guitars and a mournful chorus. The issue resurfaces in his description of a "ghetto dawn" in 'Safeway Cart'. Often less is more. An echo effect on the thin sounding 'Trans Am' creates palpable anxiety; a piano flutters,cloudlike on the pretty 'A Dream That Can Last'. Same old Young: burning bright, but not burning out. 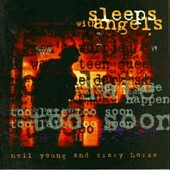 It is accompanied by a ghastly picture of Neil with a caption that reads: Neil Young: His 'Sleeps With Angels' reveals itself gradually.